The Shimano SLX RT66 6-BOLT Rotor features a lightweight and sleek design that is super reliable. This is a great product,does just what it says,quiet no squeaks,only con I have is that I bought 2 packs of mounting screws,and the rotors came with hardware.it was not stated in description. There is nothing I hate worse than hitting the brakes and sounding like a bunch of Costa Rican howler monkeys. The rotors (with proper break in) seem to be some of the best at keeping the noise levels low while maintaining some great durability. Maybe not the lightest out there, but definitely worth a gram or two. Best bang for your buck...No need to get the Icetech unless you like wasting money. It stops and I'm alive! I upgraded my single speed from 160mm to 180mm and wasn't looking for something to break the bank (considering my SS wasn't high end).. but it does the job.. I can be more reckless and faster, and I know this rotor will stop..
Don't forget the adapter, if you are upgrading to a larger rotor! the rotor looks attractive to me. I personally like one piece silver design for looking, rather than the higher end ice tech etc. There is no issue installing and use it. The only draw back of the Shimano package is the quality of the 6 bolts included are just okay. You need to be very careful when using T25 bids installing it. The new SLX rotors are the XTR of 2 years ago. I have been riding this set for the last 2 months and have had no warping. I am running 180 mm front and rear and have more stopping power than I need. These are a great buy for the price. Best bang for buck. Works with resin or metallic pads. Paired up with SLX brakes these rotors are great. These SLX rotors really do a nice job, especially for the bucks. I had an Ice Tech rotor that became fouled not too long after I put it on. You never know when that sort of thing might happen. So, since I pay for this stuff myself, why spend the extra money? These rotors work great for the riding I do, downhill switchbacks in rocky, rooty terrain would be the place I need these the most, and they've never failed to perform well. Can you have too many bikes? I bought 1 for my front and 1 for my back tire, after using an inferior brand rotor for about 2 years and dealing with the horrendous noise they made. After a quick install and some new pads, I ran through the burn-in process and hung the bike up for the day. Yesterday I took it out and rode about 8 1/2 miles and I LOVED the way these feel! I have full confidence in these rotors and the pads grip them way better than my last rotors. Modulation and feel are excellent as well! Moving my XT Icetech rotors from an older wheel set to what is currently my race/good-weather wheelset I could not justify paying the xt rotor price for what are now training wheels. Can't feel any difference in breaking performance. Not sure if the Icetech technology would show on some extra long descends or whether it is all just a marketing trick. On my digital scales the SLX rotor + 6 screws comes up as 128-130g comparing to 121-126g for the XT. Shimano RTV 66 brake rotors! Awesome for XC riding! They fit like they are supposed to. They're true. They are durable, and thank the maker they don't squeal. 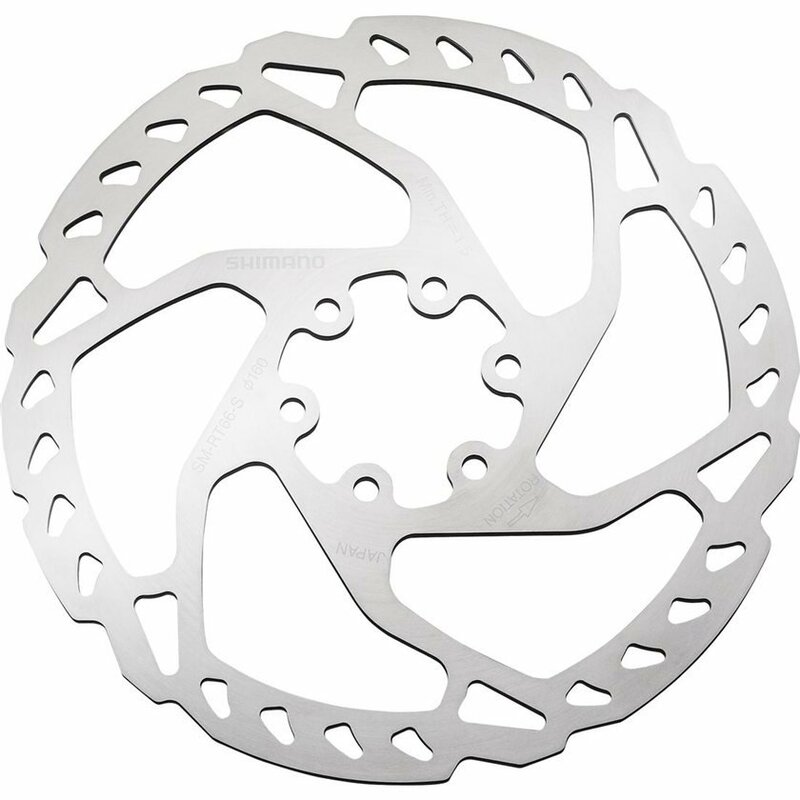 These are a great set of rotors that will handle all the aggressive XC riding you can dream of! Great product at a great price! Easy to install and they stop with no noticeable overheating on AM/XC/Enduro rides. Not a con, but the edges are super sharp, so be cautious when installing and working around them. I have been buying the more expensive Ice Tech jobbies for quite a while. I hit them on rocks or something flies up and hits it quite frequently. They aren't tough and can't reliably be straightened. These bad boys work the same and are much more tough. They take a beating and can be straightened. No three piece bonded crazy stuff. Simple steel that just works. You can't beat the price either! Recently replaced some low-end Shimano rotors that came with my bike that that stated "resin pads only", these pads are compatible with metal pads. While these are not Ice-Tech rotors they still work really well. Only have about 100 miles on them so far, but you cannot beat these rotors for the price. These are great rotors. We needed to replace the rear rotor on my son’s Nukeproof and this was a perfect match to the original. It was extremely true and has not shown any signs of warping. Great purchase at a great price. Easy, fast and perfect transaction. Item just as described. What you see is what you get. Disc comes with lock washers and 6 star head screws that have a dab of blue lock-tite on the threads. Note: I could not find torque Recommendations in the packaging so I looked Online and the recommendations I could find suggested 2-4 nM torque on the screws. My torque wrench would not click while trying to tighten screws at 3 nM and the heads began to strip. Screws come with blue lock-tite so my rec is to tighten till snuck but don't try to get 2-4 nM or you may strip the heads. I wish Shimano would put torque recs in a prominent place on the box or inserts. The rotor is well machined, and perfect. It easily bolted into place withe provided thread-locked screws and locking dog bone washers. 180 rotor are amazing with a slx 675 brakes. It works perfects. Good product , nothing negative! Does what it's supposed to do! Performs well. I had to bed my pads in...once that is done. Performance is really good. cheap too. Just your basic disc rotor, and it works very well. Quality packaging means it arrives straight and true unlike other brands that ship in just a plastic bag. Includes good quality bolts as well. Economical, works well, is not heavy. Was true (flat) out of the box. Has excellent stopping power. My plan was to get ICE tech rotors when these wore out. Problem is they last forever! Great value!!! Not much to say here, these rotos work, are true, and are half the price of Sram centerline ones. I love Shimano parts. Might be a little heavy but these get the job done and at a great price too! I went back and forth on these or the ICE Techs. I ride a lot, and honestly I can't feel any difference, even on long descents. They work for me. It works really good, easy to install, really good price for the quality rotor. It works great with resin and metallic brake pads. Solid Disc brake for a great price. I threw this on my training rims and it works great. Great value product. They do what they are meant to do. Easy to install. Came with bolts with blue thread locker on them. Absolutely love them. No squeak. Stops when you want them to. I needed a new rotor and when I called Jenson's customer support they helped me find the right one without paying the highest price. I highly recommend the rotor and the company! Durable, not the lightest but it works. Very prompt delivery with no damage! These rotors feel just as good as the ice-tech rotors and at a more affordable price. Great set of rotors, superb lines, you can notice ´em a mile away, great surface, compatible with resin pads and metalic. Great rotor for the price. Paired with slx or xt great performance. Great stopping power for my 29er MTB. Works excellent with resin pads. As easy to install as any. Comes with locking tabs for the mounting screws. Upgraded from 160 rotors. Works as it should. Not expensive. Great service and delivery as usual. Not much to say, this rotor works and looks good going it. Make sure to wear gloves while handling it, you don't want to have to decontaminate it! Delivery was fast. So stoked. Does this rotor require the "fixing washer" for installation? Looks like it just comes with the bolts and tightening plates and wondering if this additional piece of hardware is also needed. BEST ANSWER: NO rotors require the "fixing washers" it is a redundancy to extra double ensure they meet safety regulations. the lock tight on the rotor bolts exists for the same reason, to make sure the bolts don't back out. If your rotor bolts have sufficient lock tight on them then you don't need any other hokey parts. This information provided via the bicycle safety regulations which state all braking related fasteners must have a retention system in place. Will this rotor work with Avid BB-7 brakes? The rotors should work fine with the caliper, however you would want to make sure the mounting bracket you have will work with the rotor diameter. Are the BB7 brakes on a mount made for 160, 180, 185, etc... rotors? You could get a new mount of course, but it is something to consider. Avid calipers can go with Shimano rotors... the issue is matching the rotor diameter to the caliper mount. You should be able to, just make sure you are using the proper brake pads. You'll also want to measure and make sure you buy the right size rotor. Yes. It work for both resin and metal pads. do these come in a pair, or must I buy two individually? BEST ANSWER: Says "One Piece" in the description.